A pioneering scheme which successfully put golf on prescription at two South London centres has won England Golf’s new Innovation Award, sponsored by Players 1st. Golf operator Mytime Active led the way with a pilot project at its centres at Bromley and Orpington which showed how the sport could improve the health of inactive people. Benefits included lower blood pressure, better grip strength – which indicates greater vitality among older people – and improved well-being. Now it’s set to spread to other centres and to other golf operators. 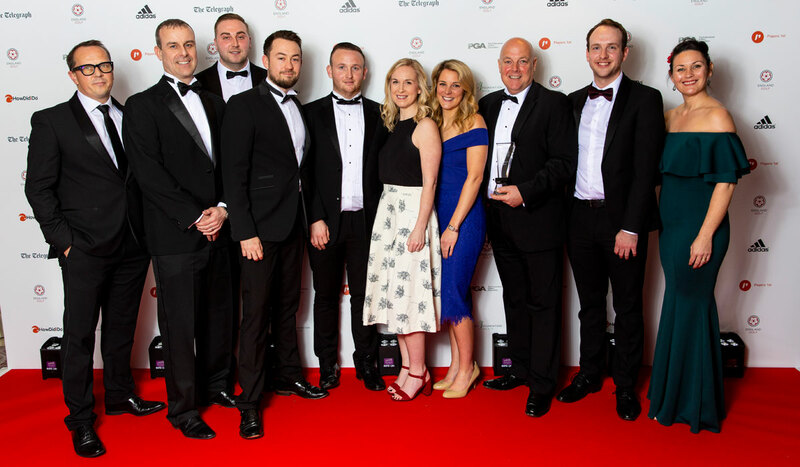 The impact of ‘golf on referral’ was recognised last night when it took the Innovation honours at the England Golf Awards, sponsored by adidas Golf. Over 400 guests at the Royal Lancaster London applauded the winners for developing a scheme which demonstrates the health benefits of golf. The judges were particularly impressed by the opportunity it offers to strengthen golf’s community links and to scale up the project nationally. “This is great,” said Mytime Active’s Scott Bartlett. “It’s one thing to come up with the idea, but another to show that it is changing people’s lives. Golf on referral was developed by Mytime Active, working with England Golf and uk active. England Golf Chief Executive Nick Pink commented: “We’re very proud to have supported golf on referral and to show there are extremely good health reasons to encourage more people to take up and keep playing the sport. The scheme sees local people referred by GPs for a six-week series of 12 sessions, which combines golf lessons with advice on changing behaviour. It continues to run at the two centres, now at a nominal charge of £2.50 per session. From next month is will also be extended to Mytime Active’s centres at Barnehurst, near Bexleyheath, Hatchford Brook in Birmingham and Dibden, Southampton. Mytime Active has 16 courses in London, the Midlands and on the south coast. It aims to make the game fun and accessible to all. The award was presented by Amelia Lewis, Players 1st UK Regional Manager. Golf Access, which encourages beginners to learn on the course, not just the practice ground.